Kidney beans are soaked for 6 – 8 hours and pressure cooked till soft. Tomato onion gravy is prepared with a couple of spices and cooked rajma beans are simmered in the tomato onion gravy sauce till kidney beans absorbs all the flavors. 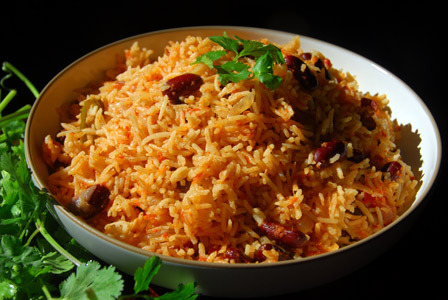 Serve kidney beans masala with pulao or with roti. Makes: around 4 Servings of Kidney Beans Masala. Soak rajma in water overnight and refresh under running water the next day morning. Pressure cook the soaked rajma in 3 – 3 1/2 cups of water for 3 whistles or until the rajma / red kidney beans are cooked and turns soft but not mushy. Alternatively, cooking the rajma in a large pot of water takes around an hour to soften all the rajma. Strain the cooked rajma and reserve the cooking liquid. Heat oil in a pan on medium high heat, add caraway seeds, cumin seeds, cinnamon, bay leaf and cloves. Stir in chopped tomatoes and cook till tomatoes soften and become mushy (around 15 minutes). Then stir in cooked rajma / kidney beans and the reserved cooking liquid with quarter to half cup of water (if necessary). Then add coriander powder, red chilli powder and salt. Lower the flame to medium – low heat and cook covered to let rajma absorb all the flavors. After around 10 minutes, uncover and stir in whisked yogurt and garam masala. Cook for a minute, stir in cilantro and remove from heat. 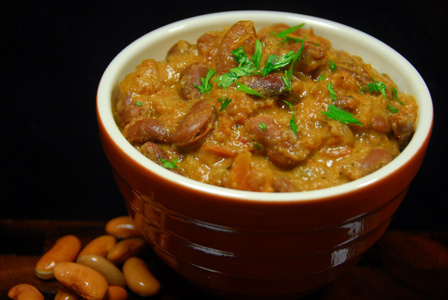 Serve kidney beans masala with steamed rice or pulao or with roti. Notes:Make sure to reserve the cooking liquid in which the kidney beans are cooked. Suggestions:If the rajma is not cooked properly in pressure cooker, make sure it is cooked well in the tomato onion sauce. Perfectly cooked rajma when lightly pressed should become mushy. Variations: Chopped tomatoes can be swapped with freshly made tomato puree, which takes less time to cook but the taste varies. Canned kidney beans can be used in place of pressure cooked kidney beans but there is a huge taste difference. Other Names: Kidney Beans Masala. 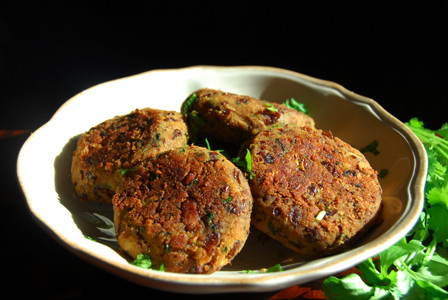 Rajma galouti kebab is famous kebab of Awadhi cuisine, Uttar Pradesh. Its typically a non vegetarian dish made with rajma (kidney beans) and minced mutton. Here is my vegetarian version of the rajma kebab with spices and fresh herbs. Kidney beans are soaked overnight and boiled till soft. Onion and spices are fried in oil and mashed kidney beans are mixed in. The mixture is made into kebab and shallow fried till golden brown. Makes: around 5 Rajma Galouti Kebabs. Soak kidney beans in water overnight and refresh under running water the next day morning. Pressure cook the soaked rajma in 4 – 4 1/2 cups of water for 3 whistles or until the rajma / red kidney beans are cooked and turns soft but not mushy. Strain the cooked rajma and keep aside. Peel, remove ends and finely chop onion. Clean, wash and finely chop cilantro and mint leaves. Heat a tsp of oil in a pan, add cumin seeds and onion. Fry till onion turns translucent, add ginger, garlic, green chiles and salt. Cook for a minute and add coriander powder, cumin powder and turmeric powder. Immediately, add kidney beans and stir. Thoroughly mash the kidney beans mixture with a masher. Keep stirring and make sure there is not too much moisture left in the kidney beans mixture. Remove from heat, stir in garam masala and lemon juice. Take big lemon sized mixture out of the mashed kidney beans and form soft ball using both hands. Slightly flatten the formed ball to form into a tikki / kebab and keep aside. Repeat the same with remaining kidney beans mixture. Heat a flat pan on medium heat, apply a tsp of oil to it. When pan gets hot, place around 3 kidney beans kebab on the flat pan. Fry for couple of minutes and add few drops of oil on the top uncooked side. Turn the cooked side facing up and cook till both sides are golden brown. Carefully remove the kidney beans kebab onto a plate and repeat with remaining kebab. Garnish with cilantro and serve kidney beans kebab with lemon, onion rings and chutney of you choice. Notes:Make sure the kidney beans mixture has enough moisture to hold them together. Suggestions:If the kideny beans mixture is too wet, put it back on heat and fry till it loses some of its moisture content. Add mashed potato to the mixture to hold it if everything else fails. Variations: Mashed boiled potato can also be added to the kidney beans mixture which helps in holding the shape of the kebab. You can also add crumbled paneer or khoya or cashewnut paste to enrich the kebab. You can also deep fry the rajma kebab if you wish. Other Names: Kidney Beans Kebab, Kidney Beans Cutlet, Rajma Kebab, Veg. Rajma Galouti Kebab. 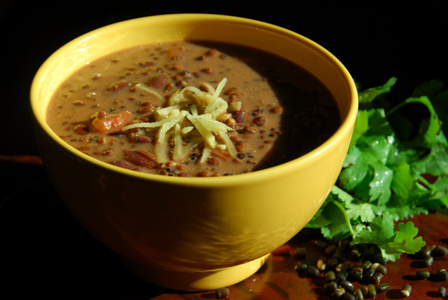 Dal makhani is the famous Punjabi dal made of whole urad / black lentils. Black lentils are traditionally cooked on a slow fire for a long period of time until the urad turns soft and creamy. Here, whole urad is soaked overnight and pressure cooked till soft. It is then tempered and cooked along with other spices. Dal makhani is generally topped with cream. Makes: around 4 Servings of Dal Makhani. Soak whole urad and kidney beans in around 4 cups of water overnight or for at least 8 hours. Pressure cook the soaked urad and kidney bens in 3 3/4 cups of water for 3 whistles. Peel and julienne half of the ginger for garnish. Heat ghee in a pan, add cumin seeds and asafoetida (if using). Then stir in chopped onion and fry till translucent. Now add green chiles, ginger, garlic and salt. Fry for a minute, add tomato and cilantro. Stir in coriander powder, cumin powder, turmeric powder, red chilli powder and garam masala (if using). Cook for few seconds and remove from heat. Combine the above tempering with pressure cooked urad and kidney beans. Adjust the consistency of this dal with quarter cup or more of water if required at this point. Pressure cook the tempered dal for one more whistle or cook covered on low heat for 10 – 15 minutes. Finally add the light cream to the dal and cook for another minute or two. Garnish with fresh cream, cilantro or ginger julienne and serve dal makhani hot with roti or naan. Notes:Make sure whole urad / black lentils are thoroughly cooked and buttery before removing the dal makhani from heat. Suggestions:If the dal makhani is too thin, simmer for 5 – 10 more minutes for the sauce to thicken. Variations: Pureed tomatoes can be added in place of chopped tomatoes. Few tablespoons of chana dal can also be added to dals during soaking time. Well whisked yogurt is sometimes added for the creamy texture. All the tempering ingredients can also be added to the soaked dals before pressure cooking the dals. Other Names:Dal Makhani, Maa ki Dal, Kali Dal. Rajma chawal is a very popular Punjabi dish made from red kidney beans and served with steamed rice. Kidney beans are soaked for 6 – 8 hours and pressure cooked till soft. Tomato onion gravy is prepared with a couple of spices and cooked rajma beans are simmered in the tomato onion gravy sauce till very soft. 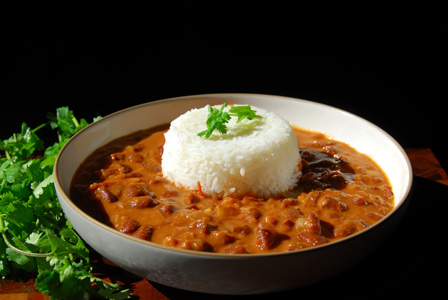 Prepared rajma is layered on steamed rice and served. Makes: around 4 Servings of Rajma. Strain the cooked rajma and reserve the cooking liquid obtained by it. Heat oil in a pan on medium high heat, add cumin seeds, cinnamon, bay leaf and asafoetida. Fry till the tomato onion mixture comes together since having a small amount of moisture in it and this takes around 10 – 15 minutes. Make sure to scrape the bottom of the pan frequently to avoid scorching. Then stir in cooked rajma / kidney beans and the reserved cooking liquid with quarter to half cup of water. After 15 minutes, uncover and cook to for the required consistency of rajma. Add vegetable stock or water to thin out the rajma if required and cook for 5 – 10 more minutes. Serve hot rajma chawal with steamed rice and a dollop of ghee. Other Names: Rajma Chawal, Raajma Chaval, Kidney Beans and Rice.